Feeling a little bitter about this year’s election season? Do all of the candidates leave a sour taste in your mouth? JPG Photography wedding clients Mitt Coats and Samantha Gutierrez feel your pain, and have brought a little sweetness — and humor — back to politics with their venture line of “Candidate Candy.” Next time you have a sugar craving, you can satisfy it with a few Clint Cats, Trumpy Taffy, or Bernie Bears. 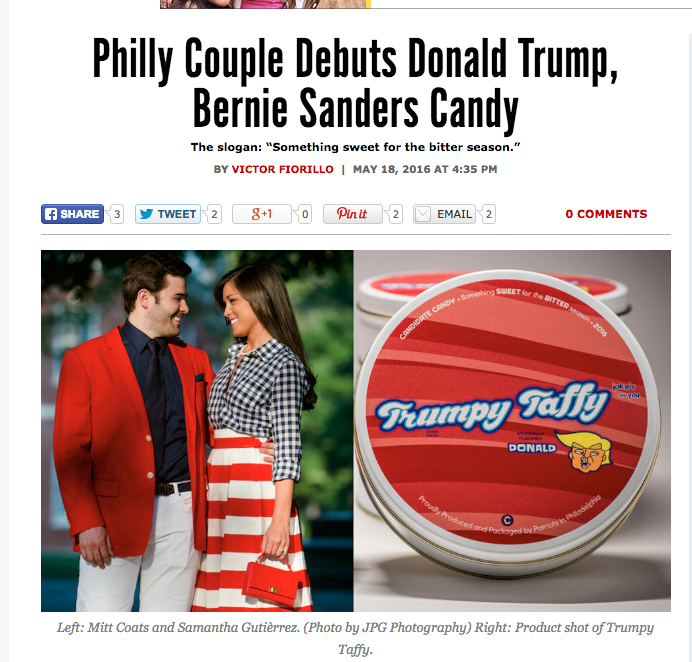 The candidate-mocking product line was shot right here in the JPG studio, and has just been featured in Philadelphia Magazine. The team was delighted to work again with Sam and Mitt, who had us shoot their wedding in 2013, and we absolutely loved the concept. 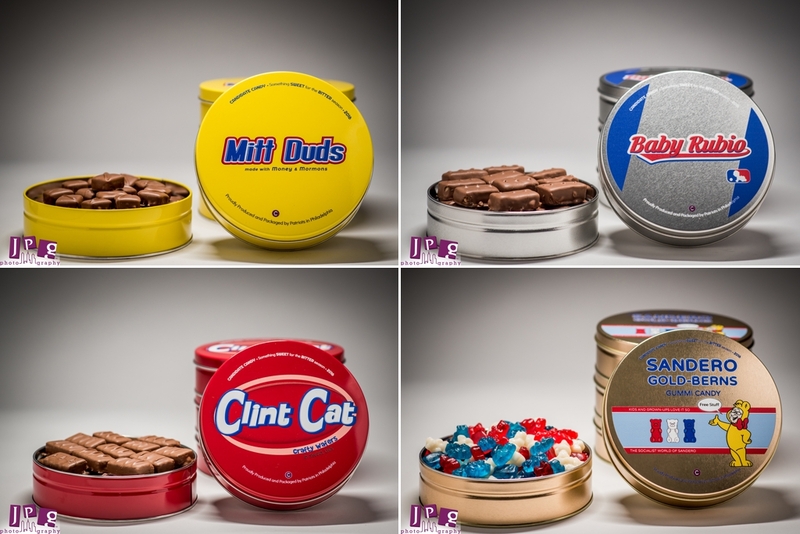 They brought their creative confections into the studio where our product photographers captured them in all of their delicious and satirical glory. The candies themselves have been sourced from different companies, mostly local, that the couple agreed were the best. They chose Atlantic City’s James Salt Water Taffy for Trump, and Zwahlen’s in Valley Forge for Clinton, to name a few. 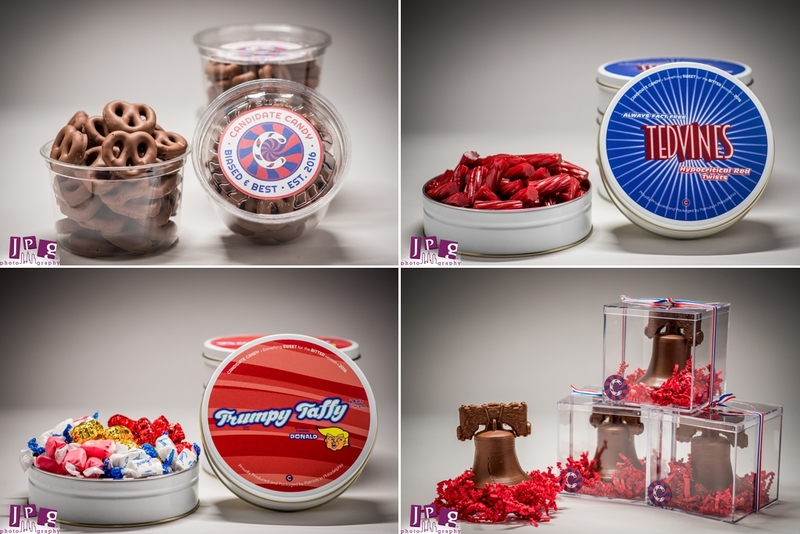 In addition to having a laugh while enjoying a treat, customers can feel good knowing that a portion of the profits made from “Candidate Candy” is going to great causes such as St. Jude’s Hospital for Children. Sam and Mitt have also pledged to donate 25 cents to the Wounded Warrior Project every time someone interacts with the brand on social media, so get out there and retweet these sweets! When asked who their own favorite was in the presidential election, the couple laughed. Good luck with your new endeavors, Mitt and Samantha! We’re happy to contribute to your success.